When I look at the state of the world we live in, it almost feels offensive to go shopping, sing silly Christmas songs, wrap presents, and celebrate the season. How can we celebrate when all of this is happening? It's easy to turn on the TV and immediately land on something tragic. And aside from what's happening in our world, what about the things that happen right around me? People lose babies, hope for babies, say goodbye to spouses, say goodbye to parents, lose jobs, have illnesses that can't be stopped. We all are so weary. Disperse the gloomy clouds of nightAnd death's dark shadows put to flight. When I look at things through the lens of my earthly eyes, the bad is often all I see. But something happens when I remember what Jesus did. The darkness is still dark and the sadness in our world is still there, but there is a hope that breaks through. In the past few weeks and months, I've never been more thrilled knowing that my hope is in nothing here on this earth. Putting my hope in the Lord isn't me shutting out the tragedy in the world and blindly following some god that I want to believe is there. My hope is in the Lord because I have seen and experienced his goodness, grace, love, and power in my life. I am comforted and relieved knowing that my celebration of Jesus isn't put on hold because of the darkness in this world or the circumstances I find myself in. Rather, my celebration of Jesus begins and is increased because of it. I celebrate because this world is not my home and my time here is not the climax of the story. Because even in the midst of the most awful things, I can rest in knowing that the Lord can redeem any situation and will ultimately redeem everything. Because I know that all of the good I see in the world and in people is because the Lord is gracious and still working through us. "Jesus is the reason for the season" is a phrase I grew up hearing and believing. But this year, those words seem to carry more truth and weight. My hope is wrapped in this tiny baby's entrance into the world. Jesus' life gives my life reason. He is what keeps me moving and keeps me getting up every day. He gives me joy and purpose and fills my soul. He pushes me to love people and show compassion. He exposes my sin and faults and offers grace and forgiveness. He comforts and protects me. He delights in me. Nothing the world offers could possibly do all of that for me. People and things will fall short every time. Jesus is it. He's the only reason there is. Jesus is the cure our world is stumbling around to find. 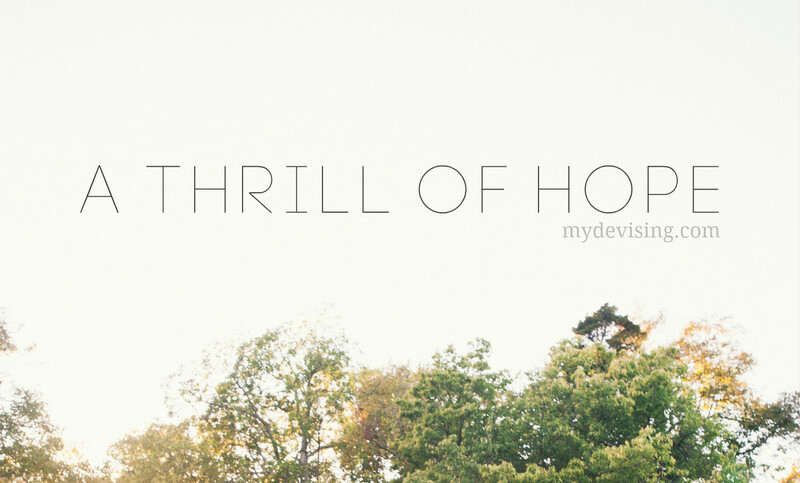 This Christmas season, I pray that you will experience the thrill of hope that only Jesus offers.